Bryan works nearly full-time, but he still cannot afford a place to live in St. Charles County. Bryan had stable housing earlier this year. He was working nearly full-time at a local fast food restaurant, but when it was time to sign a new lease Bryan just couldn’t afford it. He stayed at hotels for a while, but even though he continued working, eventually the money ran out. 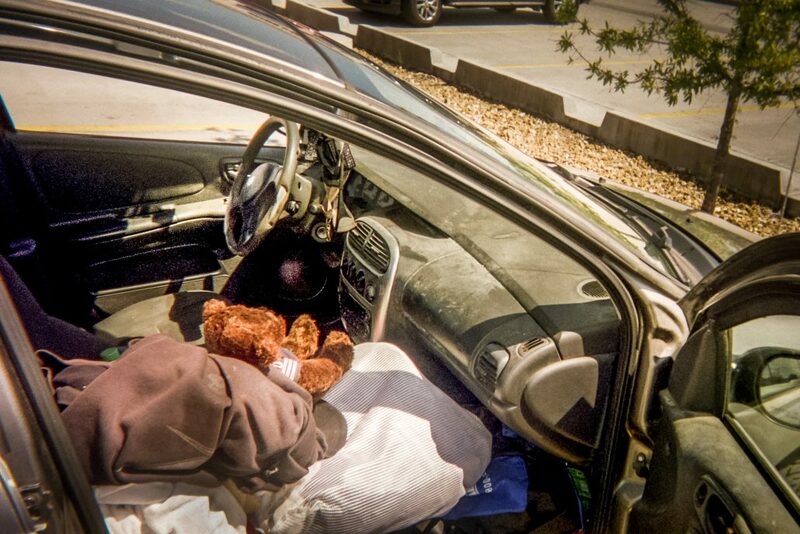 He’s been living in his car for the last several months with all of his belongings. He eats his meals at the Salvation Army soup kitchen. Bryan spends a lot of his off time at the St. Andrew’s Cinema. “For a buck you can go in and watch a movie,” said Bryan. “I’ve been watching a lot of movies.” His photos show a typical week in his life, capturing some of his regular hang out spots, like the Cinema, QuikTrip where he parks to sleep, his car and the local fast food restaurant where he works. Bryan works about 35 hours a week, but he is still struggling to find affordable housing. “I can’t find a place to live,” said Bryan. Bryan hopes the In Plain Sight project opens the eyes of people in the community to see that homelessness is an issue here in St. Charles County. Bryan dreams of a stable home and a full-time job in the future. “I want to be able to relax a bit,” said Bryan.